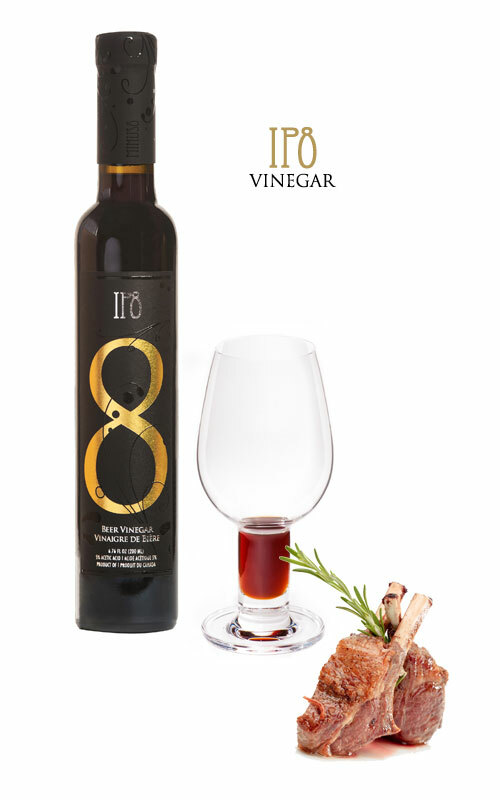 IP8 Vinegar begins with beer made in the style of IPA (India Pale Ale). A blend of aromatic and flavourful hops are used to enhance the hop characteristics in the vinegar. Sweet, delicious juice from Minus 8 premium icewine grapes is blended in. There is no oak aging. IP8 is meant to be used fresh, like beer. It is made in small batches for freshness. Aromas: A very complex, multifaceted vinegar that evolves with time. Initially slightly earthy and resinous on the nose, with roasted malt and (light roast) coffee bean notes; then the aromas develop with additions of candied apple, buckwheat/wild-flower honey, pine and spicy/hoppy notes; afterwards the nose becomes additionally layered with exotic aromas of jasmine, light citrus rind (orange and grapefruit) and both cooked and tropical fruit notes. Palate: Richly sweet and balanced with zingy acidity, exhibits a palate is as expansive as the aromas; first there are intense flavours of roasted barley, browns sugar and sweet caramel; overripe golden pineapple, sweet grapefruit, biscuit and toasted pine nuts and resin follow; finish is lingering and complex with jasmine tea, melon, orange/lemon peel, and light soya sauce/miso paste notes.